Rosewood residents will have the opportunity to vote in the following races in the general election on Tuesday, November 6, 2012. 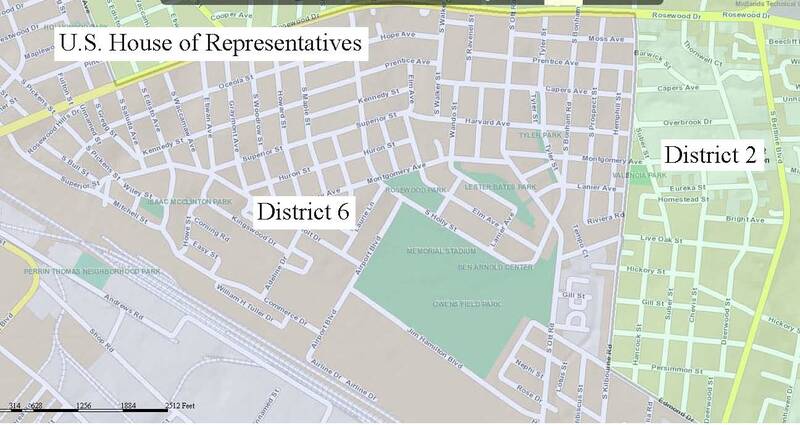 Voters in District 6 of the U.S. House of Representatives will choose between Incumbent Congressman Jim Clyburn and his Green Party challenger Nammu Muhammad. Many voters in Rosewood now vote in a different U.S. House District due to the redistricting process after the 2010 census. U.S. House Districts in Rosewood. Click to enlarge. U.S. Congressman Joe Wilson is running unopposed for the U.S. House of Representatives 2nd District. S.C. Senate District 20 voters will choose between Republican incumbent John Courson and his Democrat challenger Robert Rikard. All of Rosewood is in Senate District 20. Click here for a map of the district. S.C. House District 75 voters will choose between Republican Kirkman Finlay and Democrat Joe McCulloch. Incumbent James Harrison is not running. S.C. House of Representatives districts in Rosewood. Click to enlarge. S.C. House District 72 is currently represented by James Smith. Representative Smith is running uncontested in the 2012 election. Richland County Council District 10 voters will choose between incumbent Kelvin Washington and petition candidate Helen “Ree” Daniels Taylor. 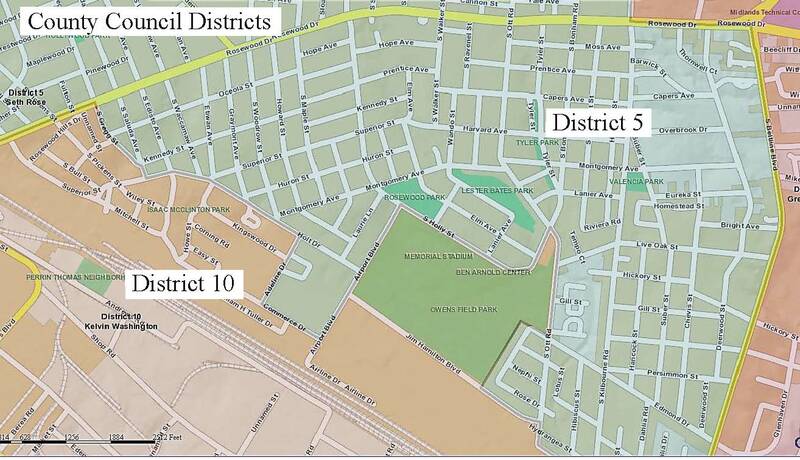 District 10 covers the Rosewood Hills and Edisto Court areas of Rosewood. Click here for a map. Four candidates are running for two Richland County School District One At-large seats. Vince Ford and Barbara Scott, both incumbents, are running again for the seats. Moryah Jackson and Antjuan Seawright are also each vying for an at-large seat on the board. Voters may vote for two at-large candidates. Richland County School District One, Seat Three is open due to a vacancy. Beatrice King is running unopposed to fill the seat. Seat Three encompasses all of Rosewood. The Richland County Penny Tax referendum will be on the ballot. Read how the penny would benefit Rosewood. A state constitutional amendment would require the Governor and Lt. Governor to run on the same ticket. Read more here. 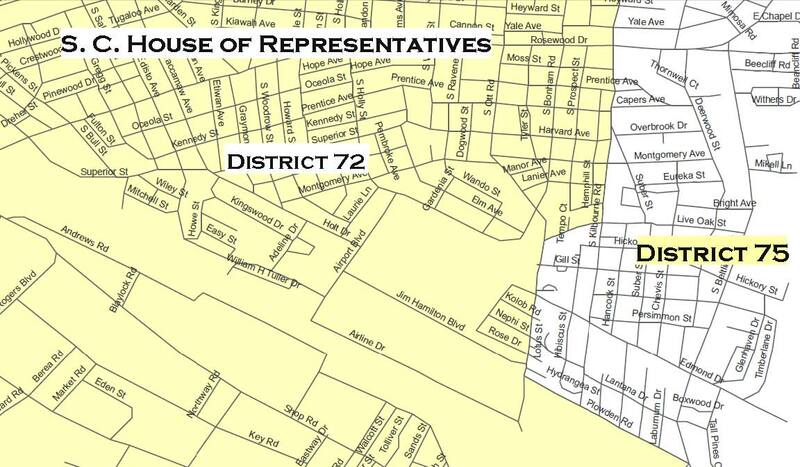 Which House district do I live in? Where can I learn more about my elected officials? This entry was posted in Reminders and News and tagged statehouse election by Cyndy. Bookmark the permalink. What an incredibly helpful tool–thank you Rosewood Community Council for putting this together for your appreciative neighbors!